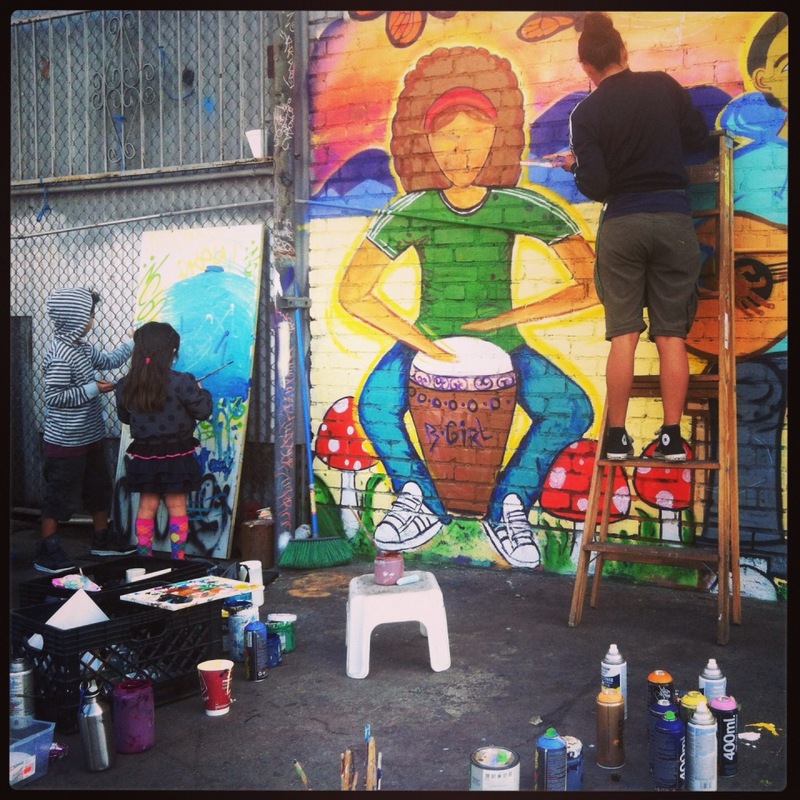 Queremos Paz y Dignidad: Mural @ Antigua Coffee House, Los Angeles, CA. 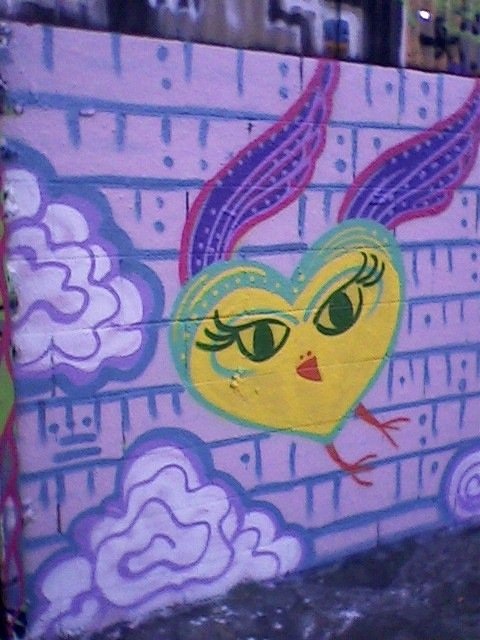 This mural was designed by a good friend (and hater) of mine, Raul Gonzalez. 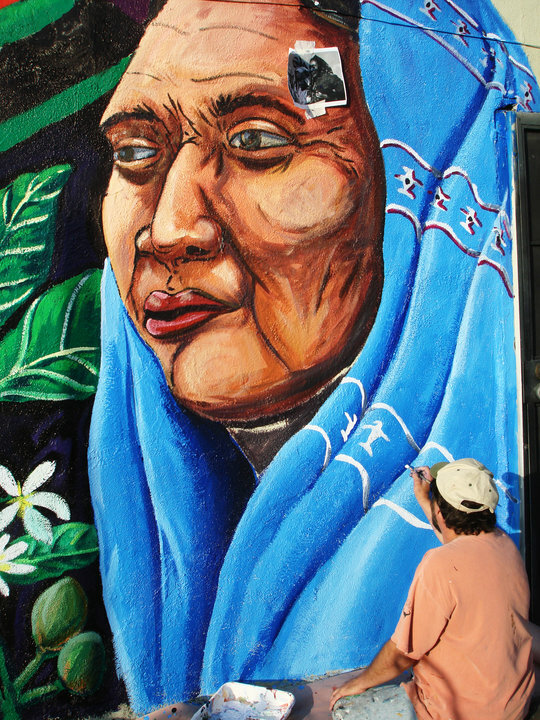 This mural was painted on the side of Antigua Coffee House, a coffee shop in the community of Cypress Park/Highland Park in North East Los Angeles. It has been a privilege in getting to Yance a little more these last few months as I was preparing to exhibit my work at his coffee shop. He’s passionate and serious about his work in transforming the community in a positive way as a business owner and supporter of youth, activist, artists. 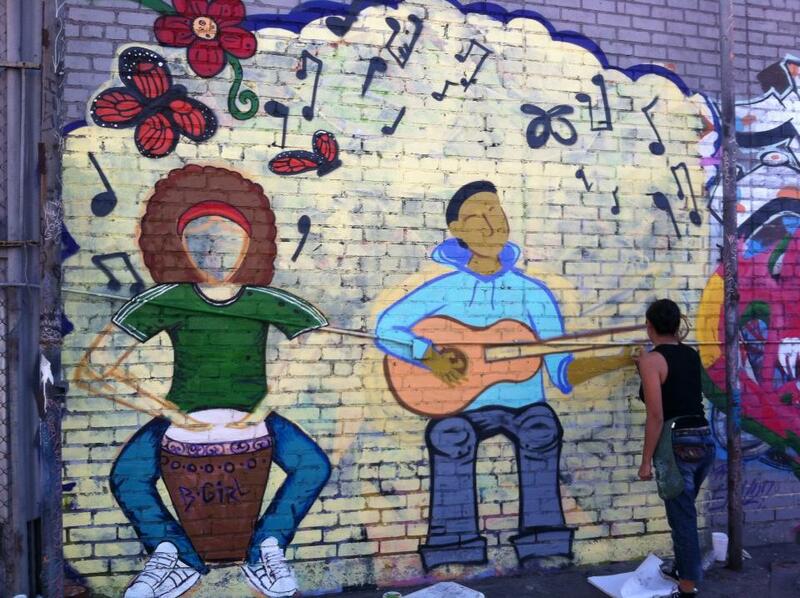 I’m really glad Raul invited me to paint a Central American themed mural. 6.12.10@1PM: And so it begins, the drawing is up, let the painting commence! Funding for this project came from LA City Works and they sent a bunch of volunteers to clean the neighborhood. Another blog has been written about this project, here. I arrived when Raul was drawing on the wall with a charcoal pencil. He threw it down like a G, drawing the whole piece within a couple hours. By the afternoon we were ready to add paint on it. Below is a picture of Carlos Callejo. He’s been painting mural for over 20 years. I had the privilege of meeting him and painting with him for the first time in Oct. 2009 when we were restoring the Great Wall of Los Angeles. 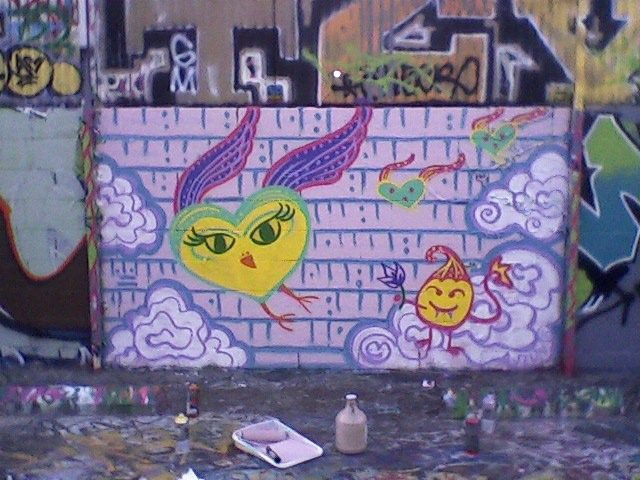 After 8 hours of painting we would all kick it, drink some chelas, play some music (Chicano music!) and laugh it up. He’s been in the movement since the 70’s and still very passionate about organizing and speaking for social change. El Maestro Carlos Callejo painting like it ain’t no big thing. He’s done atleast 60 murals before. 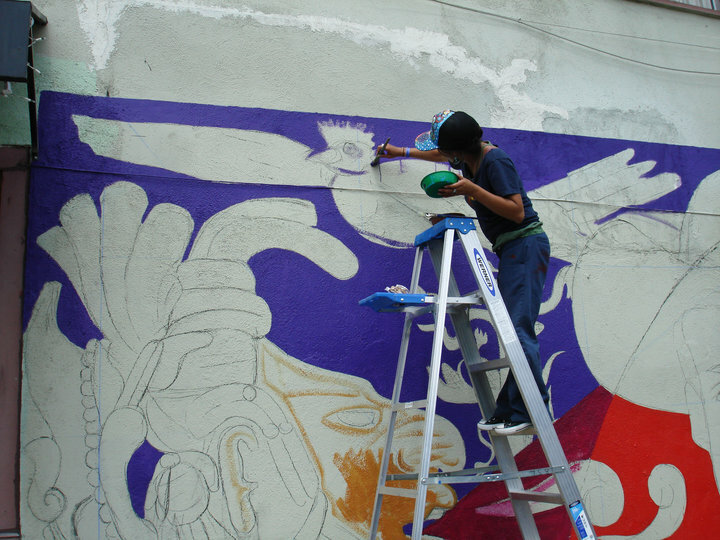 Muralist Raul Gonzalez just keeping it real. He only paints to instill some knowledge in your brain! Raul doesn’t seem to paint without a cause. He’ll break his head if he had to paint simply for aesthetics. All of his murals make strong political and historical statements. 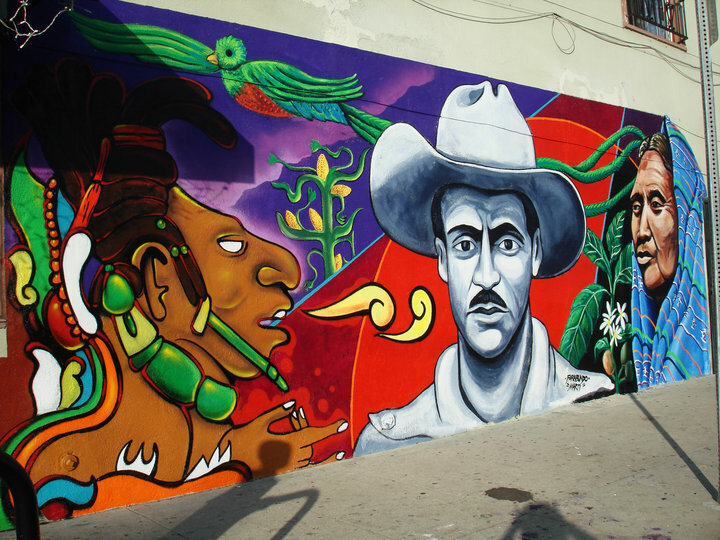 The man in the center of the mural is Farabundo Marti, a man born in El Salvador who organized for workers rights and fought for the liberation of the most oppressed throughout Central America. The orange link is worth clicking, its a song that tells his life story. 6.13.10 Brushes down! 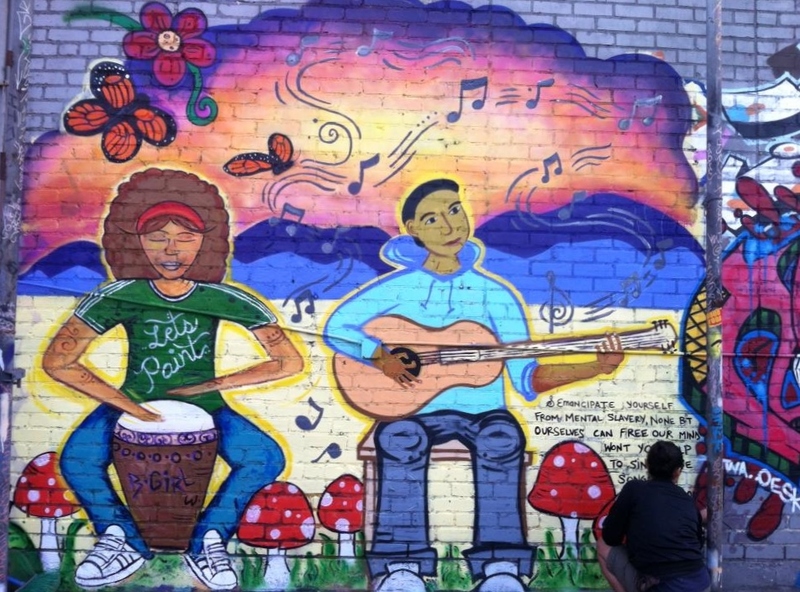 Let the mural speak for generations to come! Completed in 2 days. “Yah!”, said the Sun as he put his shades on, “I agree, its too much for me to look at and shine”. The Colors of the Earth became sad and they wanted to hide. They couldn’t believe what the Owls and the Sun were saying. They felt ashamed and decided that it would be best for everyone if they simply left. So the Colors gathered their courage and decided to leave the Earth. They left far into Space and traveled for many, many light years. They saw new planets, stars, and colors they did not know existed. Meanwhile the Earth grew dull, gray, and boring. The animals and the plants began to feel depressed. The Earth began to miss the life of Colors. Although the Owls liked the darker side of things, they did not want to be selfish Owls. They talked amongst themselves and wisely decided that they needed the Colors on Earth. “Hello, we come from Earth. They didn’t want us over there anymore so we are searching for a new place to live. We like it out here in the Universe, it’s huge and there’s room for us here.”, said the Colors. “We don’t believe you should just wander in this Universe without a purpose. Everyone and everything serves a purpose in this Universe. Yes, it is big here, that’s why you must chose your destiny. Call the dragon, we need to take you to the All Seeing, …It will figure out what you are best at. Do you know what you are good at?”, asked the Ninjas. Dragon came and picked up the Ninjas and the Colors. Dragon is fast and can move through the galaxy faster than anyone else. The urgency was clear. The Earth was becoming more depressing everyday…the plants were hardly growing, the hummingbirds stopped fluttering, and the birds were not inspired to sing anymore. 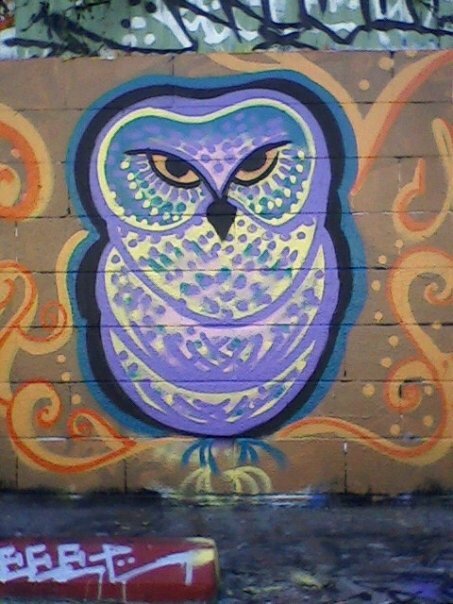 The Owls phoned the All Seeing and gave it a hoots up. 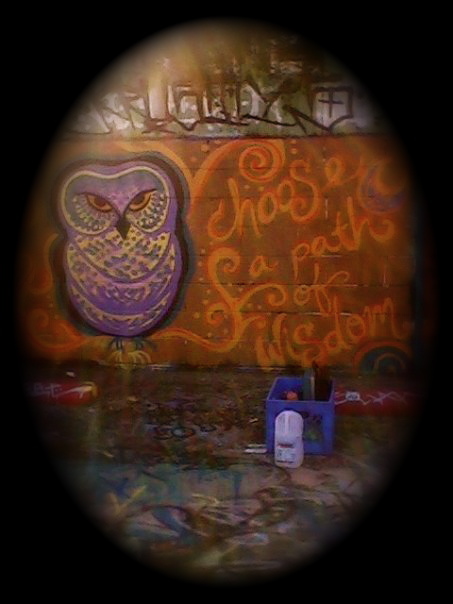 The Owls wisely knew that the All Seeing would be the one to find the Colors and return them to Earth. When they arrived the All Seeing was playing and joking around. It doesn’t like taking reality too serious. “Oh you are the Colors from Earth… Wow you really are beautiful!”, said the All Seeing. “You really think we’re beautiful?”, the Colors responded shyly. And so the Colors returned home and everyone instantly became happy. They thanked the colors for their return. Everyone wanted the new colors that were brought back to Earth from outer space. There was a huge celebration in all the oceans and in every land. No one would ever complain about Colors again. Colors are the magic of life, love, and growth!